Foote Brothers is a family-owned and operated business in Ipswich, Massachusetts. The business was started by Harold and Rose Foote in 1955. 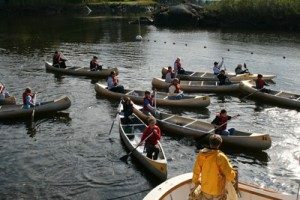 We have been renting canoes from our livery at Willowdale Dam on the Ipswich River since 1955. Our rental fleet consists of both 15′ & 17′ top-of-the-line Grumman canoes, and 12′ Perception Prodigy Kayaks. We also provide a shuttle service to several drop-off points upstream, and instruction for beginners. Overnight and longer trips are available by arrangement. Our friendly and knowledgeable staff members are happy to help you choose the run that’s right for you.